Voltage regulation through Fixed Voltage Regulator IC is the most suitable method.78xx series positive and negative regulators are widely used to get fixed voltage to drive loads. Here explains a circuit design to get regulated voltage from a 12 volt 500 mA power supply .This circuit can deliver 5 volts at 300 mA for driving a load. 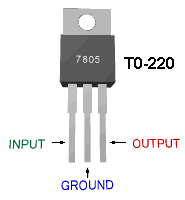 The circuit is Voltage and Current regulated and with Polarity and Surge protection components.